Tomatillos are a gorgeous fruit, and they are an integral ingredient to one of my favorite cooking sauces from North America–salsa verde. The fruit, which is encased in a papery husk like a leafy Chinese lantern made of mulberry paper, is often thought of as simply green in color, but the truth is, the hues it comes in are myriad. Subtle shades of kiwi, celedon, celery and leaf green are mixed with butter yellow, cream, and golden mushroom tones. Some fruits are even speckled and streaked with dusky violet which complement the greens and yellows in a way that many painters and interior designers would envy. There are a couple of farmers who grow tomatillos here in Athens, and they seem to have had a bumper crop this year. Like the tomatoes which have been extremely flavorful (probably because of the very long summer drought we have had), this year’s tomatillos have been fairly bursting with flavor. Not simply tart, but also sweet, with a tangy pineapple fragrance and a rather herbal, woody tang, these tomatillos were perfect for making some salsa verde to can for the winter. Nearly every ingredient in this salsa is local: I paired the local tomatillos with red or violet sweet bell peppers, and plenty of red onions, garlic and chilies. The hot version had green jalapeno, poblano and Anaheim chilies, while the mild had just poblano chilies.To raise the acidity to safe levels for canning, white vinegar was used, but significant amounts of lime juice were also added, while cilantro, cumin and smoked paprika boosted the flavor. Of course, there is also some salt to round out the flavors and keep the salsa from tasting flat. 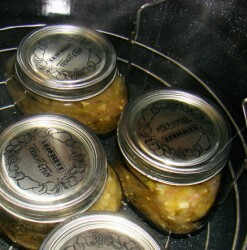 I adapted the recipe from The Ball Complete Book of Home Preserving which is edited by Judi Kingry and Lauren Devine. The only things I changed about were the types of chile peppers and the seasonings–it is not a good idea to change the amounts or proportions of acidic to non-acidic ingredients in recipes that are going to be put up in a hot water bath (non-pressure) canner. This is because the acids used in these recipes are part of what helps prevent bacteria from growing in the canned food. Cooking it is simplicity itself; you just chop the ingredients–I did the tomatillos in medium sized dice, and the peppers and onions in small dice, and minced the garlic and cilantro–and then put everything in a pot, bring it to a boil, turn it down and simmer it for ten minutes. 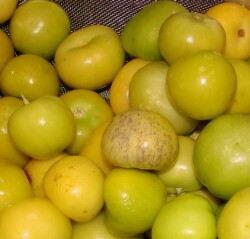 I find that the colors look especially lovely in the uncooked salsa–not only does the red onion boost the sweetness of the salsa and complement the natural sugars in the fruit, but the violet color, even in the finished, canned product, looks lovely flecked through the variegated greens of the salsa. The recipe I give here fills five pint jars or ten half pints. Whether you pack into the larger or smaller jars, the processing time is the same–you boil them in the covered canner for fifteen minutes. Then, remove from heat and let sit for five minutes before opening the canner and lifting the jars from the water. So, what do I intend to do with my finished salsas verde? Make enchiladas verde, of course! Or chile with pork and white beans….mmm. There are lots of possibilities for soul warming foods to be made with this salsa in the coming winter months. Wash five pint or ten half pint jars, their lids and rings thoroughly in hot, soapy water and rinse well. Put lids in a saucepan and bring to a simmer–not a boil–and allow to simmer for ten minutes. Turn off heat and keep the lids warm. 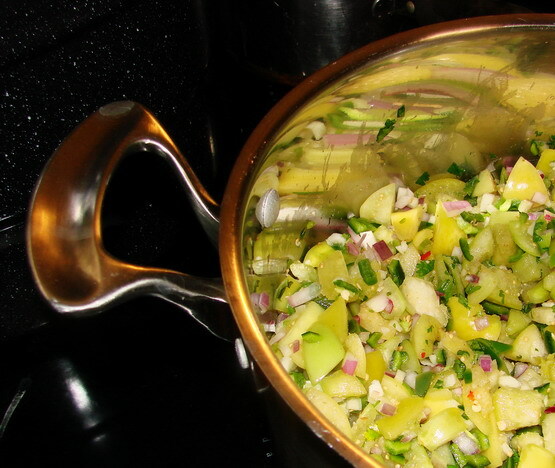 Put all the ingredients to the salsa in a clean, heavy bottomed dutch oven or stockpot. Bring to a boil, stirring constantly, then turn heat down and cook at a vigorous simmer for ten minutes, stirring now and again. Turn heat off of salsa. Following the instructions in my post on pressure canning–fill hot jars with hot salsa, and leave 1/2 inch of headspace at the top. Make sure there are no air bubbles in the jars, and wipe rims of jars, then top with a lid and screw down the ring. Do not tighten ring–just scew it on until it is firm, but not tight. Put filled jars back into rack in canner, and lower them into the water. Make sure the water covers the jars. Bring to a boil, cover the canner, and process at a full boil for fifteen minutes. Turn off heat and remove canner lid. Let the jars cool for five minutes, then remove from the canner with jar lifter and set on a folded clean towel on your counter away from drafts. (If your kitchen is drafty, or your counter is near an open door or window, cover the jars with another clean towel. Leave undisturbed for about eighteen hours. Check to make sure the lids have sealed properly–they should be concave and you shouldn’t be able to easily pry the edges up–then tighten the rings on the jars, wipe the jars down and store them in a cool place out of direct light. Makes ten half pints or five pints of salsa. I have been preserving lately. Just bottle 15 jars of tomato-pepper chutney. A few weeks ago I made fig jam and ginger-pear chutney. I’m waiting for the apples to come in and will make some apple chutneys. 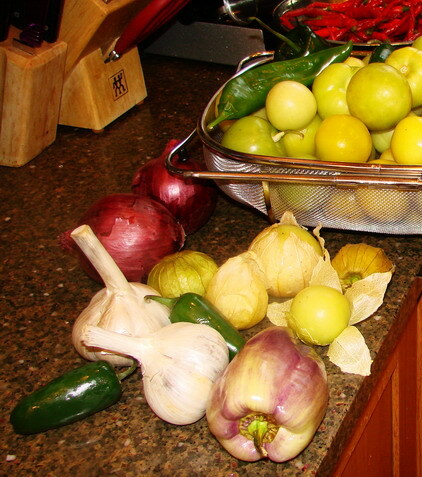 You mention ‘husking’ the tomatillos- I haven’t used them. Do they have tough skins? Yummy! Can you post your recipe for your chili with pork and white beans as well? If you look at the closeup picture I have–they have a papery outer husk–like a Chinese paper lantern. You just peel that off and then wash and core and chop the fruit. Grace–when I make it next–I promise to. And I should probably make it sooner rather than later because I have some tomatillos left to use. I just now read the article in rediff.com featuring your blog. Congrats and best wishes. Does your towel under the finished jars really say ‘Edamame Dearest’??? Bindya–it is nothing to be afraid of. Just follow basic safety rules and use approved recipes and follow them exactly and do not alter processing times or acidity. It is a wonderful kitchen art–one that I would be sad to see disappear. Timepass–I just discovered that I was featured in rediff–it is very exciting. Thank you. I have a weird sense of humor, what can I say? Spanish smoked paprika, also known as pimenton, is available at Penzey’s. Just look them up on Google and mail order it. Their spices are great and the shipping, at least through the US is fast. I cooked some of this up tonight. I didn’t core the tomatillos though. I’ve never used them “chunky” I’ve always processed them in a blender anxious to see how this turns out…I too enjoy enchiladas verde as well as chili verde. Best wishes and happy canning! If I want a really mild version, should I use 2 cups of the poblano chiles? 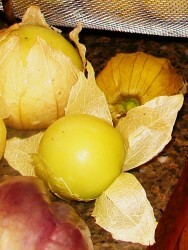 I have been given a big bag of tomatillos and can hardly wait to try this recipe. Have never had salse verde before and can’t eat hot spicy things though. Salsa and Tomatillo Salsa we love it. Sue, use half to 1/3 of the amount of poblanos and replace the rest with sweet bell peppers. That should do a great job for you. Betsey, mine reseeded themselves and grew beautifully even in Zone 5 Ohio after a really cold winter.I was amazed. Thank you for this recipe it looks fantastic I’m growing Tomatillo’s this year for the first time and I’m looking forward to makeing this one. Thanks for this recipe, I just got a crate full of tomatillos and didn’t know what to do with them. I also have my own recipe for green sauce for enchiladas, but is different than yours, I am trying this one tonight, as I love green chicken enchiladas. Yum! have you ever roasted the whole mixture and then canned it? would it be unsafe for any reason??? Tomatillos are more acidic than regular tomatoes, so if you want to make tomato salsa to can, find a recipe specifically meant for regular tomatoes. 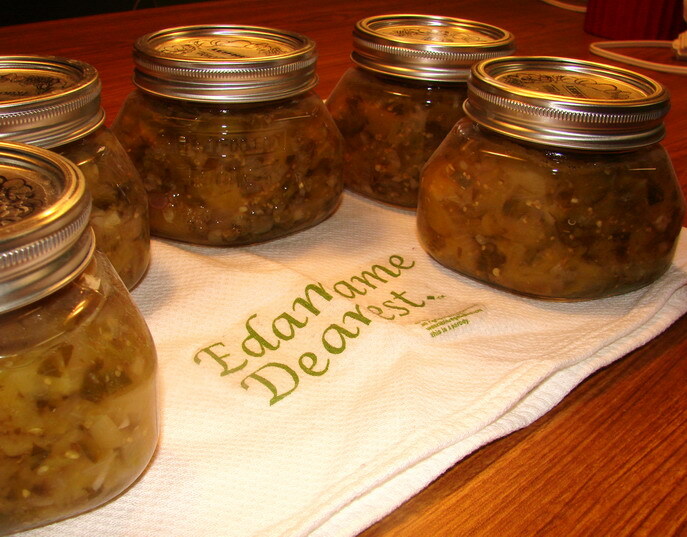 If your acid balance is off when canning, you risk allowing dangerous bacteria to grow in your food. I’d like to can my tomatillos but don’t have the same peppers in my garden as in your recipe. I have mini sweet bell peppers and both green and red jalapeno peppers. As long as I use the same total amount of peppers does it matter how many of each kind? Yes, you could use different types of chilies and sweet peppers. Just keep the acidic balance the same. Can you freeze this as well as can it? Thanks for the recipe. I wanted some chili verde but tomatillos are not readily available in SE KY. So, I planted 6 of them. Then, I learned that each will produce 10 pounds. I’m enjoying my chili verde but have way too many. Now I can can them and eat “fresh” tomatillos all winter long.